Here are the composers for Festival da Canção 2019! 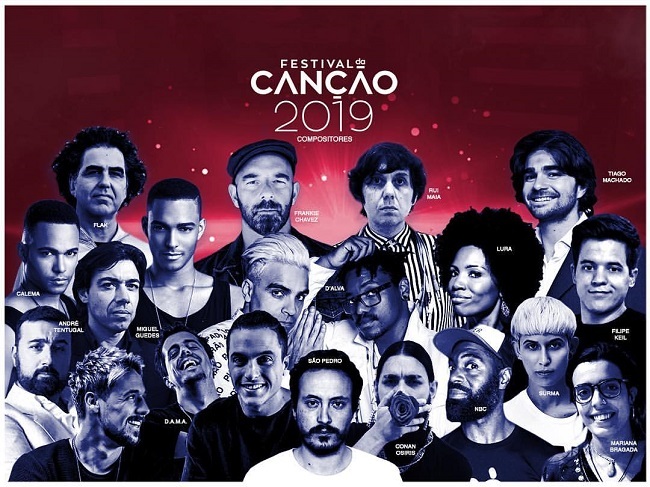 Portuguese broadcaster RTP have today released the list of people who will be composing the songs of Festival da Canção 2019! Since 2017, the Portuguese use a system where RTP invites songwriters to write whatever they want and then choose the performing artist themselves! This year, fourteen of the 16 composers were chosen that way. Both Filipe Keil and Mariana Bragada have walked a little bit of a different way towards getting elected. Filipe has been chosen as the best submissions from the public submissions and Mariana Bragada is from Radio Masterclass, a radio show by Antena 1. Two semi-finals (on February 16 and 23) will be held with eight entries each. In both semi-finals a professional jury and the televoters will get a 50% say each in which entries qualify to the final on March the 2nd. In the final seven regional juries will decide the outcome alongside the Portuguese televoters. Noteworthy: in case of a tie in the semi-finals, the juries get their way, whereas in the final the televoters will have the last word. The artists these composers have chosen will be announced at a later moment. 27 songs received for Montevizija 2019, but only 10 met the necessary criteria! Heidi Ruud Ellingsen and Kåre Magnus Bergh to host Norway’s Melodi Grand Prix 2019 on March 2nd!